He was a doctor and an anti-corruption activist for the locals in Satara till the police arrested him last week in connection with the murder of an anganwadi teacher this June. 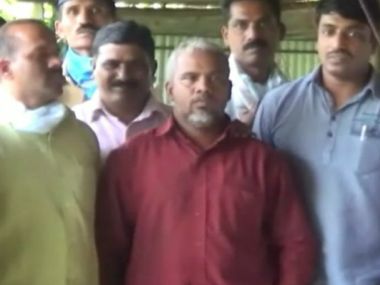 Forty-two year-old Santosh Pol from Wai, in Maharashtra's Satara district, on Tuesday told the police that apart from killing Mangala Jedhe — the anganwadi teacher — he had murdered five others, including four women, between May 2003 and August 2016. Pol even tried to mislead the investigators probing the "disappearance" of Jedhe, by giving a written complaint to police saying Jedhe had duped him of 233.3 gram of gold on the promise of doubling it. "Pol confessed to committing multiple murders during interrogation in the case of 47-year-old Jedhe's death, following which police exhumed four bodies, apart from Jedhe's, from his farmhouse last night," Sandip Patil, superintendent of police, Satara, told PTI. Pol, who is being dubbed as 'Dr Death', will be in police custody till 19 August. He was arrested on 11 August. Pol allegedly kidnapped and murdered Jedhe, president of Maharashtra Purva Prathmik Shikshika Sevika Sangh, on 16 June. According to the police, Pol and his aide Jyoti Mandre, a nurse who allegedly had an illicit relationship with the accused, kidnapped Jedhe and killed her by administering a lethal injection and buried her near Pol's farmhouse. "Pol and Mandre had kidnapped Jedhe from a bus stop in Wai on 15 June, when she was on her way to visit her daughter in Pune, and took her to his poultry farm near Dhome village, where she was murdered by administering an overdose of lethal medicine and was buried," Patil said in a press release. "However, in order to mislead the police, Pol approached the local crime branch and filed a written complaint, accusing Jedhe of duping him by taking his 20 tolas (233.3 grams) gold with a promise that she would double it," he said. Police also said he registered a case with the local police that unidentified people had attacked him after the "needle of suspicion turned towards him". In the past 13 years, whenever a missing person’s report was filed by the victims' relatives, police would pick up Pol on suspicion and interrogated him on multiple occasions, but he was never arrested. The police further said that while investigating Jedhe's murder, whenever the needle of suspicion turned towards Pol, he would try and distract everyone by holding protests against corruption. After checking the call details of Pol and Mandre, police came to know that Jedhe was in contact with them and zeroed in on the latter, who later spilled the beans. Police then picked up Pol on 11 August. He later showed the place where he had buried Jedhe. During interrogation, Pol told police that besides Jedhe, he had killed four women and one man in a similar manner between 2003 and 2016. "Pol had killed Surekha Chikane on 20 May, 2003. In August 2006, one Vanita Gaikwad became his victim. On 13 August, 2010, he killed one Jagabai Pol. A jeweller named Nathamal Bhandari was killed on 7 December, 2015 and on 17 January, 2016, he murdered one Salma Shaikh. And Jedhe was murdered on 16 June this year," police said. Out of the six, Chikane's body was buried near the doctor's house in Dhom and those of Jagabai, Nathmal, Salma and Jedhe near his farmhouse, whereas the body of Gaikwad was thrown into a reservoir. "After Pol's arrest, we exhumed Jedhe's body and after his confession, skeletons of four victims, buried at farmhouse and near his house were also exhumed," police said. Special Inspector General of Police, Kolhapur Range, Vishwas Nangare Patil said the motive behind all the murders is still to be probed and that Pol is not cooperating in the investigation. "However, it looks that there could be a financial angle behind all these murders. We will probe each and every angle," he said. SP Sandip Patil said Pol was also planning to eliminate Mandre, who was a witness to Jedhe's murder. "In this act, which appears to be serial killings, there could be a different motive behind each murder. Prima facie, we feel gold was one of the motives," Special Inspector General of Police (Kolhapur range) Vishwas Nangre-Patil told The Indian Express. Primary investigations revealed Pol and Mangal knew each other since 1998. "Therefore, with the help of Jyoti, who is a nurse, Pol administered anaesthesia to Jedhe and then buried her body in his poultry farm land in Dhom village on 15 July," said a police officer. According to Mid-Day report, two pits — five to six feet deep — were found a few feet away from the place where Pol had allegedly buried four of his victims. "The probe team was shocked to find the two open pits," said the senior official. "When questioned, Pol admitted Jyoti was next. While investigating Jedhe’s disappearance, call data records showed us the last caller was Jyoti and we decided to call her for questioning." "He had dug up a place near his poultry farmhouse, where he was supposed to bury her after killing her. It was Mandre, who led us to him and he was apprehended," he said. Taking cognisance of a series of murders by Pol, Satara police have made an appeal to the residents living in and around Dhom village to come forward and report if their family members have gone missing after visiting Pol's clinic. "After our appeal, two people have come forward and informed the police that their respective family members are missing and suspected Pol's involvement in their disappearance," Patil said. According to Hindustan Times, Pol was known to pick quarrels with the villagers. Most of the people in Dhom, therefore, preferred to stay away from him. Pol had also contested the gram panchayat election a few years ago but could not win it. In 2013, he said an assistant police inspector (API) attached to Wai police station had died in an accident and there was talk that Pol might have been behind his death. "The API had initiated action against Pol's criminal activities and police suspect that Pol might have gotten him killed in that accident," Patil added. "Now, we will start investigating that case and see whether he (Pol) has anything to do with the accident," he said. According to the SP, they would start an internal inquiry to ascertain why the missing cases were not done probed properly. "I took charge in June this year and got to know that Pol used to bring pressure on police officers by threatening them of going to anti-corruption bureau," said Patil. "Pol was such a terror in the area that after his arrest, people congratulated police and heaved a sigh of relief," he said. It seems he was not a psychopath,just a shrewd,cold blooded killer. According to police, Pol is not a psychopath, he's very cunning, which is why they are loath to believe what he says. Satara superintendent of police Sandeep Patil told Mirror, "Pol is not a psycho killer. He is mentally stable. All six murders he committed were in cold blood. Even during the interrogation, he has been giving us answers after much thought. We have to verify every detail he is giving us."